The International Federation of Robotics forecast that the global market for vacuum cleaning robots, lawn-mowing robots and other household cleaning robots will grow at a compound annual growth rate (CAGR) of 33% through 2019. Other research reports say the market will reach $2.5 billion by 2020 at a CAGR of 15%. America’s biggest provider, iRobot, in their earnings disclosure delivered this week, reported very strong sales in the United States; 2016 sales were up more than 35% over a record 2015. Total units shipped in fiscal 2015 were 2,436,000 compared to 2,174,000 units in fiscal 2014. International shipments in 2015 represented 10.77% of revenue but increased only 1.5% over 2014. 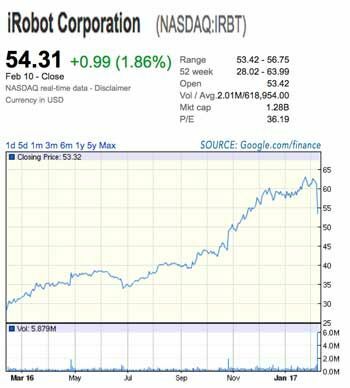 No unit data was released for fiscal 2016.
iRobot’s stock steadily doubled over the 12 months although it took a $7 dive on the date of the earnings report. The increase in domestic home robots revenue was primarily attributable to increased sales as a result of significant investments in advertising media and national promotions as well as the launch of Roomba 980. International home robots revenue growth slowed compared to fiscal 2014 as a result of negative macroeconomic conditions, specifically in Japan and Russia, offset by a significant growth increase in China. 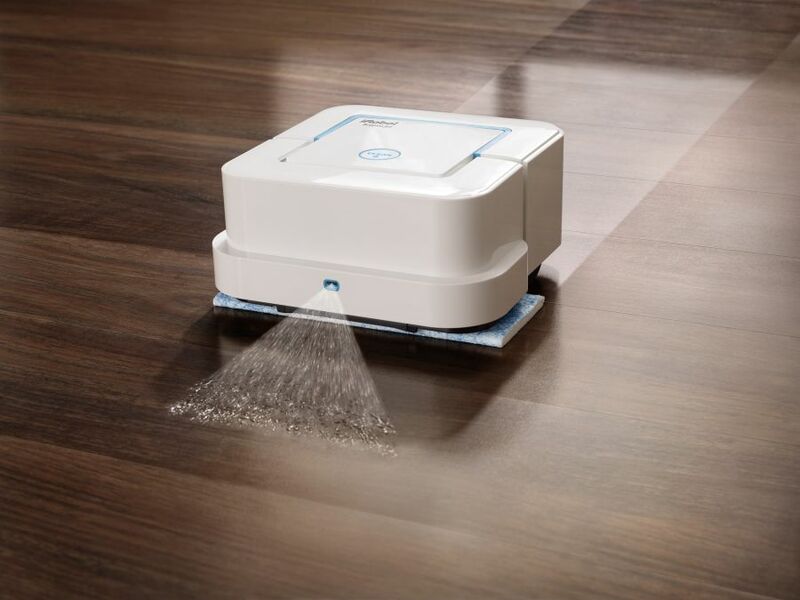 iRobot is eyeing Asia for growth and recently launched a $290 Braava jet mopping robot customized for China. iRobot has also acquired the iRobot related distribution business of privately-held Sales On Demand Corporation (SODC) based in Tokyo, Japan. The acquisition, which is expected to close in April 2017, will enable iRobot to get closer to Japanese consumers and retail partners, and thus allow the company to better address Japanese market needs. Mother’s Day, Father’s Day and, in China, Singles Day are big shopping holidays. Singles Day is held on November 11th (11/11). [November 11 was chosen for the annual holiday because no other date has as many 1’s, or “singles”.] On that date in 2016 Ecovacs popular robot vacuum Deebot outsold TVs to emerge as the top-selling home electronic appliance on Tmall, a business-to-customer platform of Alibaba, the online sales network. Ecovacs reported that their online sales exceeded $47 million which equates to approximately 188,000 units. “China’s swelling middle class has a rising demand for domestic cleaning, home security and surveillance robots,” said Luo Jun, CEO of the Asian Manufacturing Association. “Robots can make doing housework interesting and cool,” said Liu De, co-founder and vice-president of Xiaomi. As a consequence, both domestic and foreign enterprises are scrambling to participate in the market. Chinese home appliance firms such as Haier Group and TCL Corp are eyeing the market with similar products, making the market increasingly crowded. Chinese smartphone vendor Xiaomi Corp launched a smart vacuum cleaner last September. Priced at $246, the machine is equipped with 12 sensors and a central processing unit. Instead of bouncing around the room and haphazardly picking up debris, Xiaomi said it can automatically measure the size of the room and map the best routes to do cleaning. iRobot is planning to quadruple its presence in the Chinese market after setting up its Chinese headquarters in Shanghai last September. “The global household robots market is growing about 25 percent annually, but in China, the growth rate is close to 70 or 100 percent,” said Colin Angle, chairman and CEO of iRobot. Prominent companies besides Ecovacs and iRobot operating in the market are Dyson Ltd., Infinuvo, Koninklijke Philips N.V., LG Electronics Inc., Neato Robotics Inc., Intellibot Robotics, Yujin Robot, and Samsung Electronics to name just a few. At CES in Las Vegas in January, one could see that the current consumer products fad seems to have shifted gears from big TVs to robots. CES may well become the goto tradeshow for consumer oriented robotic start-ups. Smart devices for the home offering compatibility with Amazon’s Alexa, Google Home and Apple’s HomeKit were all crowd pleasers but one could see Amazon everywhere. By opening up their Alexa Voice Service, its now being integrated into cars (Ford, VW), smartphones (Huawei), robot vacuums (LG), remotes (DirectTV) and LG refrigerators. Voice activation that works – as Amazon’s Alexa and Siri are proving – is becoming real and offers a new selling point for techies and other early adopters of robotic vacuums and other home products.